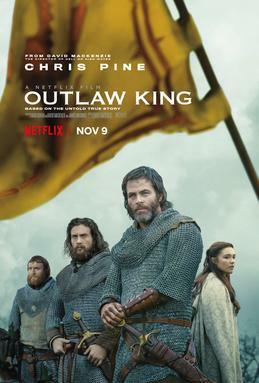 ‘Outlaw King’ is the latest big Netflix release and it’s a really enjoyable historical drama about the legendary Scottish King, Robert the Bruce. I was fortunate enough to see the film at Edinburgh’s Filmhouse on its limited cinematic release, and I wish Netflix considered doing these short runs with all of their films. I suspect most non-Scots knowledge of the particular period of Scottish history ‘Outlaw King’ depicts will come from the famously historically inaccurate ‘Braveheart’ (a film which I love, despite its flaws), and ‘Outlaw King’ is definitely rooted more in fact, and takes place mostly after the events of Mel Gibson’s award winning movie. The film is directed by David Mackenzie, and he reunites with one of his ‘Hell or High Water’ leading men in Chris Pine to portray Robert the Bruce, and Pine is very well cast, even mastering our notoriously difficult accent! The narrative is to many extents an origin story about the rise of Robert the Bruce, specifically about how he moved from a position of accepting English rule after William Wallace’s capture, to leading the fight against it. The film is brutal, bloody and certainly earns its 18 certificate as it spares no quarter in depicting the violence of the time period, as we follow Bruce as he tries to evade his captors. This takes the narrative all over Scotland and as much as I loved the wonderful vistas of our beautiful countryside, I could have done with the locations being signposted as the plot moves around a lot and even as a native I struggled with the geography. I thought the quality of the performances varied, from the good in Pine to Stephen Dillane as King Edward I and Florence Pugh as Bruce’s wife, Elizabeth de Burgh, to the bad, particularly Billy Howle who is ridiculously over the top as Prince Edward. The highlight though, has to be Aaron Taylor-Johnson as James Douglas (also known as ‘The Black Douglas’), a spurned noble who joins Bruce’s cause, with Taylor-Johnson playing him with a maniacal glee. Despite the bleakness and brutality of the narrative, I thought the film sprinkled in well placed doses of humour and moments of calm amidst the chaos. I’m naturally interested in this part of history so I perhaps enjoyed it more as a result, as the general reviews haven’t been that kind, or perhaps it’s simply better seeing it on the big screen, but I really enjoyed ‘Outlaw King’ and I’d recommend checking it out.